Sometimes I wonder if I'm speaking a different language than my children. Really and truly. 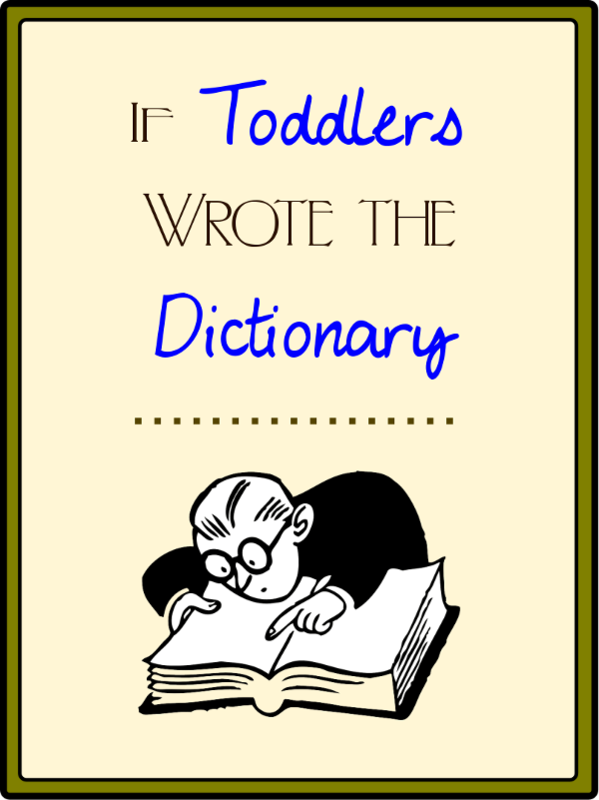 In fact, I think my toddler could write his own dictionary — if he had a firmer grasp on how to use his thumbs, that is. Banana (n.) - Hair gel. Bath tub (n.) A really good place to poop. Changing table (n.) - More modern form of a Medieval torture rack, from which escape at all costs is advisable. Cleavage (n.) - Excellent drool-catcher. Crying (v.) - A way to entertain oneself at 3 A.M.
Dust bunnies (n.) - Delicious morsels left underneath the couch for no discernible reason. Earrings (n.) - Smaller version of the rings intended for gymnastic use. Fun (n.) Pulling all the bristles off the toilet brush while everyone thinks I'm in my room playing trains. Hiding (v.) - What you do while pooping. Mine (adj.) - 1. The thing in my hands. 2. Anything I had at one point. 3. Something I rejected but then you picked up. Naked (adj.) - The optimal state of being; all efforts to return to this state (public or private) are justified. Pantry (n.) - 1. Toy box. 2. Sensory bin. Toilet bowl (n.) - The appropriate place to store the vegetable steamer and/or the remote. Trash can (n.) - Receptacle for holding leftover food until I'm ready to finish it between meals. What would be in your toddler's dictionary? Absolutely hysterical, yet so true. Hair gel is my favourite! I'm doing the same with my son right now. Honestly, it's just not worth it having him happily occupied for 15 minutes when he screams bloody murder for 20 after I take it away! Lol yaaas! My DD is 4 years old now but I would choose Screaming: Form of communication to express my dissatisfaction or pleasure with just about everything 😁. Mine definitely has the same definition for phone. Every person within a hundred foot radius if her better hide theirs unless they want to play tug war with a 2 year old. Hahaha! I think I hear Webster calling you, Jenny! When you start that game, you've already lost.